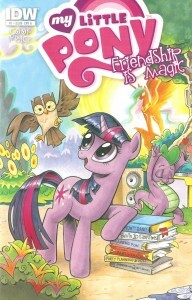 Based on the popular Hub show, the first issue of My Little Pony: Friendship is Magic brings new stories to the Pony-verse. 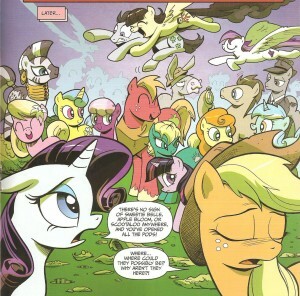 The first issue begins with some of the younger ponies stumbling upon something mysterious in the forest. This leads to the residents of Ponyville acting strangely and the main six ponies attempting to solve the problem. The issue concludes with the team heading out to rescue their kidnapped friends. 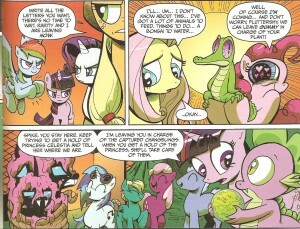 The story is very well written and ties into some of the events from the second season of My Little Pony. This also includes minor references such as Daring Do. In addition, all of the characters act in character. However, Rainbow Dash is a little uncharacteristically overdramatic. Still, everything works well and feels like an exciting episode of the show. The most surprising part of this issue is that there is a good amount of action rather than just a series of jokes or a silly one-shot adventure. There is an extra story after the main story which is just a comedic tale, but it works as a conclusion to the issue. The artwork is well done and looks like the show. The characters look more alive than they do in the show as the painted art looks better than the flash animated show. Ponyville is very colorful and it is populated by the same recognizable cast of background characters from the show. It is obvious that there was quite a bit of effort put into this art in order to make it feel like an actual My Little Pony adventure. The art is one of the biggest selling points this book has and fans of the series will appreciate the effort. When children’s shows are made into comics they are often retellings of stories from the show or they are just quick one off stories that do not add anything to the characters or the world. This issue not only sets up a new adventure, but it ties into the events from the show. More than that, it makes reference to several parts of the pony-verse that fans of the show will be familiar. This comic is made for fans of the show and if you are a fan then I highly recommend this book. If you are not a fan then you are probably not even reading this review and will probably never read the comic. If you are a fan of the series read this comic you will love it.